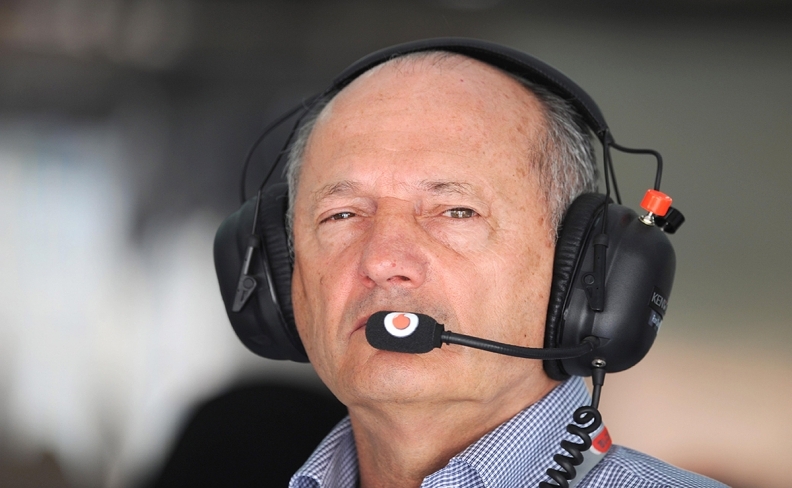 Ron Dennis was ousted as McLaren CEO in November. Ron Dennis is selling his stakes in British motor racing and manufacturing conglomerate McLaren and will step down as chairman after already being forced out as chief executive officer of part of the business. A new holding company called McLaren Group will combine the McLaren Technology Group Ltd. and McLaren Automotive Ltd. arms, with sovereign wealth fund Bahrain Mumtalakat Holding Co. and TAG Group set to remain majority shareholders, according to a statement Friday. Sheikh Mohammed bin Essa Al Khalifa of Bahrain will become executive chairman of the new group, valued at 2.4 billion pounds ($3.1 billion), and pledged to follow a policy of “evolution, not revolution” building on Dennis’s achievements. He added that there is no truth “whatsoever” in suggestions that Mumtalakat is seeking to sell its stake. McLaren, best known for its Formula 1 racing team, has been the subject of takeover speculation in recent years, with reported bidders including Apple Inc. and Chinese interests. Dennis, 70, said after losing the CEO role at McLaren Technology in November that the grounds for his removal were “entirely spurious” and came after clashes with Mumtalakat and TAG over his views on outside investment and the future of the business. The motorsport patriarch has spent 37 years at the helm of Woking, England-based McLaren and led the team to 158 Grand Prix wins, 10 Formula 1 driver’s championships and seven team triumphs. McLaren International was valued at 3 million pounds when he became involved in 1980. The group had combined revenues of 898 million pounds in 2016 and employed more than 3,400 people. Dennis successfully leveraged McLaren’s sporting prowess, second only to Ferrari in Formula 1, to establish the McLaren Automotive supercar arm. The company on Thursday rolled out the 570S Spider, a low-slung two-seater that’s part of a plan for 15 new models and variants by 2022. Deliveries nearly doubled to a record 3,286 vehicles last year, boosting pretax profit 70 percent to 9.2 million pounds ($12 million). Dennis’s stock is set to be allocated to other shareholders, largely Mumtalakat and TAG, though the transactions are not yet concluded. McLaren Group will meet with debt investors next week. Though Al Khalifa said he’ll spend a lot of time in Woking and “select and indicate McLaren’s overall direction of travel” along with TAG’s Mansour Ojjeh, he doesn’t plan to move permanently to the UK. That will leave Mike Flewitt, the CEO of McLaren Automotive, together with Jonathan Neale and Zak Brown, chief operating officer and executive director respectively at McLaren Technology, in day-to-day control. Dennis said in McLaren’s statement that he’ll continue to consult for various companies and work with the UK Ministry of Defence Innovation Advisory Panel to help to improve technology relevant to national security. JPMorgan Chase & Co. advised McLaren Group on the transaction.